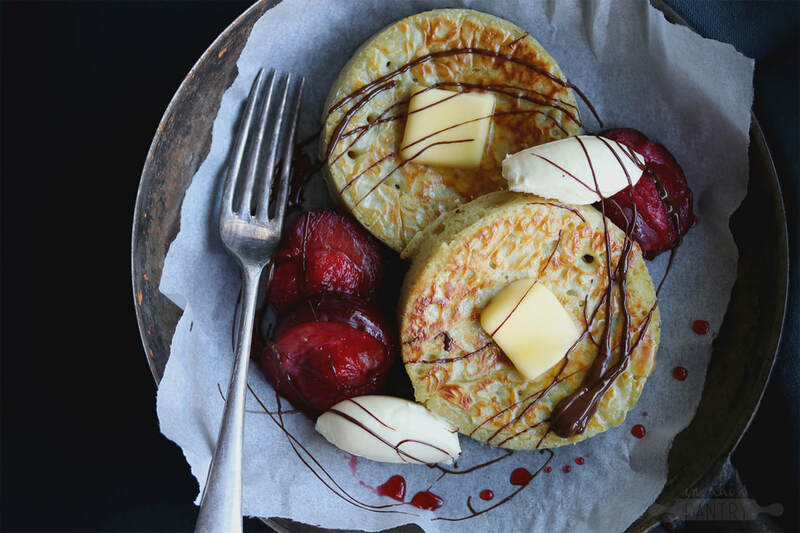 I have eaten (store bought) crumpets for as long as I can remember, and recently I've seen them popping up on the food scene seeming to become the new/reinvented kid on the block. To be honest, I had no clue on how crumpets were made, or what was even in them; aside from the basic knowledge that there was most likely flour in them (I'm a genius, I know). After sparking my curiosity with some research, I made these beauties! The crumpet base is a recipe from one of my favourite foodies Jamie Oliver, and was very easy to follow. Note - the recipe told me to cook them in egg rings but I didn't find this very successful due to how shallow they were! I ended up using pastry ring cutters which are a lot deeper, and it worked SO much better. Also, grease them heavily. Trust me. The combination of flavours in my little recipe are so so delicious together. Plums roasted in honey are the stars of the show, sitting beautifully alongside rich and creamy mascarpone cream, sweet and bitter dark chocolate and of course, a cheeky slathering of salted butter. MMHMMMMM. In a bowl, dissolve the yeast and sugar in the warm milk and 50ml of tepid water. Leave in a warm place for 15 minutes, or until frothy. Sift the flour, bicarbonate of soda and salt into a large bowl. Make a well in the centre and pour in the yeast mixture. Whisk from the centre outwards until smooth and creamy – this will take a few minutes. Add a splash more water, if needed. Cover with a damp tea towel and set aside for 45 minutes or until little bubbles form on the surface. Lay the halved plums on a baking tray, cut side up, and drizzle with the honey. Roast at 190 degrees celsius for 12-15 minutes or until the plums are tender but still hold their shape. Remove the stones once cooled. Grease 4-5cm deep cooking/baking rings with vegetable oil. Wipe a little oil around a large frying pan or iron skillet and place over a medium-high heat. Arrange the rings in the frying pan and, once hot, spoon the batter into each ring, about 3/4 of the way filled. Cook for 5 minutes, or until little bubbles appear on the surface. 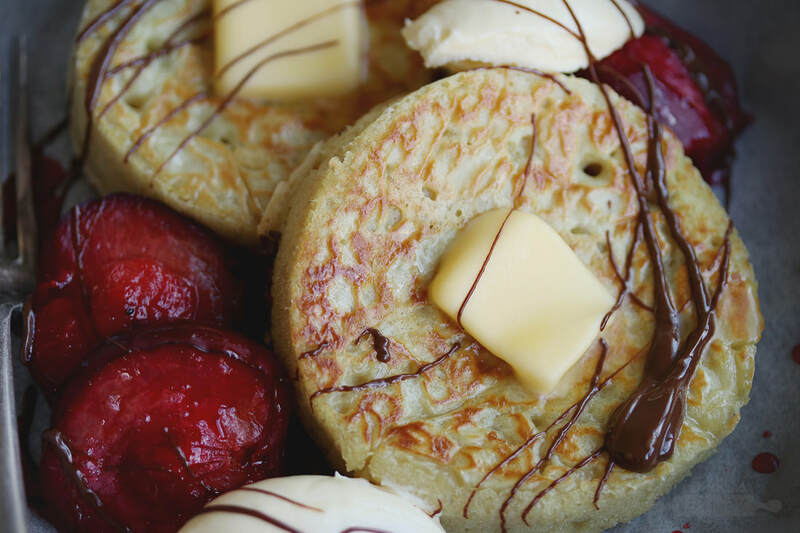 Serve the crumpets by spreading with butter, drizzle with the melted chocolate, then serve the plums and dollops of mascarpone alongside. Enjoy!